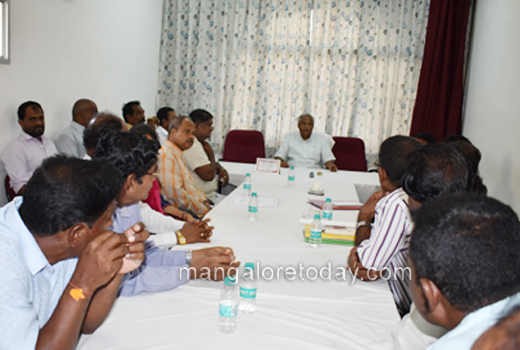 Mangaluru, Sep 07, 2017: MLA of Mangaluru South who convened a meeting of fisheries officials and representatives of fishermen at his office here has instructed the officials to increase the depth of the fisheries jetty at the old port as the existing jetty is just nine meters deep. The MLA also directed officials to take steps to clear the debris of the capsized boats in the estuary and ensure steps for free movement of boats. He further expressed resentment over the failure of the authorities to make arrangements for drinking water as well as toilet facilities in the jetty area and directed them to take steps in this direction within a week. It was decided at the meeting to invite fisheries minister to hand over the 23 sheds sanctioned for the fishermen. Mohan Bengre, President of Bengre Mahajana Sabha, Shekhar Suvarna and officials of Fisheries Department were present.